Why does one management style make employees hate their jobs while a different style inspires them to outperform and commands their respect? Emotionally intelligent people-management skills turn out to be the primary reason. In modern organizations keen to retain their most talented human capital, there may be no more important competency to develop than the skills that motivate people to outperform the competition. 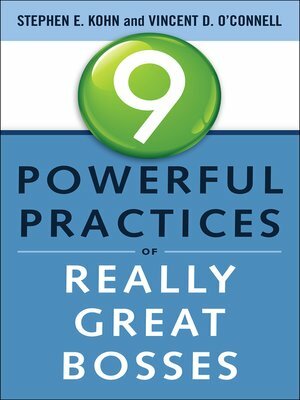 9 Powerful Practices of Really Great Bosses features a sensible, easily implemented framework organized into three distinct sets of skills—foundational, prevention of common pitfalls, and advanced relationship management. Kohn and O'Connell enhance the approaches to effective people management that they presented in their highly praised previous publication 6 Habits of Highly Effective Bosses.